In the last decade, research on the previously dormant field of camouflage has advanced rapidly, with numerous studies challenging traditional concepts, investigating previously untested theories and incorporating a greater appreciation of the visual and cognitive systems of the observer. 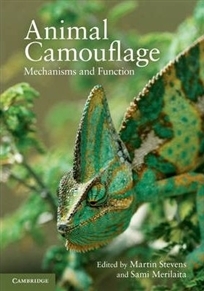 Using studies of both real animals and artificial systems, this book synthesises the current state of play in camouflage research and understanding. It introduces the different types of camouflage and how they work, including background matching, disruptive coloration and obliterative shading. It also demonstrates the methodologies used to study them and discusses how camouflage relates to other subjects, particularly with regard to what it can tell us about visual perception. The mixture of primary research and reviews shows students and researchers where the field currently stands and where exciting and important problems remain to be solved, illustrating how the study of camouflage is likely to progress in the future.